European airlines: Why do they keep going bust? Why do European airlines keep going bust? Three European airlines have gone belly up since August. Air Berlin and struggling Italian national carrier Alitalia were the first two dominoes to fall. The third -- Britain's Monarch -- halted operations on Monday, leaving 110,000 passengers stranded abroad. Three high profile failures in just 50 days has raised questions about the strength of Europe's aviation industry, which has been buffeted by fierce competition and shifting business models. Analysts say that more losers could emerge in the coming months as smaller, weaker players come under pressure. "It's primarily an issue of scale and competition," said Rob Byde, a transport analyst at Cantor Fitzgerald. "It's likely you're going to see more consolidation and more failures in the European market." Budget airlines led by Ryanair (RYAAY) and EasyJet (ESYJY) have captured huge amounts of the European market by offering flights for as little as £10 ($13.30), a model that keeps their seats full and leaves competitors scrambling. "When the industry sees that supply of seats is increasing faster than demand, they all cut prices," said independent industry analyst Louise Cooper. She said that's when the "bloodbath" of red ink begins. Smaller competitors can't keep up with the top budget carriers because they lack the required scale to negotiate discounts on pricey items like jet fuel. National carriers, meanwhile, are saddled with legacy costs and expectations that prevent them from adopting the tactics of cheaper upstarts. Gerald Khoo, a transportation specialist at investment bank Liberum, said the weakest players are now getting tossed to the side. "The common theme is that these are airlines that have been in financial difficulty for many years, under pressure from more efficient competitors," said Khoo. There are other issues dogging the industry, including a pilot shortage and deadly terror attacks that forced airlines like Monarch to avoid popular holiday destinations like Tunisia and Egypt. Byde said terror fears forced Monarch to shift some flights to crowded routes where it failed to gain an edge. For airlines with deeper pockets, the upheaval presents new opportunities. Qatar Airways announced last week that it was taking a minority stake in Italian carrier Meridiana, a move that will help expand its network in Europe. Deirdre Hutton, chair of the U.K.'s Civil Aviation Authority (CAA), said that she's not concerned about other British airlines folding. "I'm actually not worried. 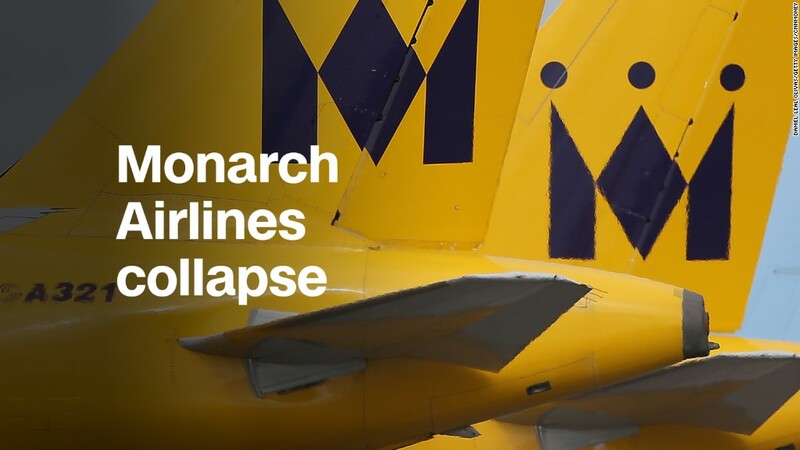 I think this was a set of issues that was very specific to Monarch," she told CNNMoney. Meanwhile, Hutton's CAA is responsible for bringing back Monarch's stranded customers to the U.K. over the next two weeks. Hutton promised these 110,000 customers that their return flights home would be scheduled only a few hours apart from their original bookings in an effort to avoid disrupting vacations. The biggest airline collapse in U.K. history also affects 750,000 people who had booked future flights and packaged tours.